Looking for a tasty, filling dish to feed the whole family on a cold winter night? Short on time and not interested in spending hours laboring in the kitchen? This one-pot slow cooker soup will be exactly what you’re looking for. 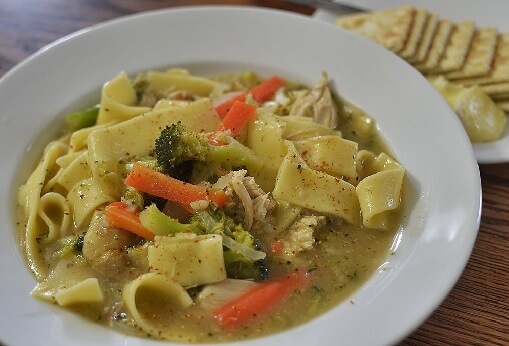 By repurposing cream of chicken soup and evaporated milk, along with some fresh vegetables and cooked chicken, you’ll be able to whip up a filling soup in no time. It will surely be a hit with the family! The dish will take about 7 hours to cook in total, using the last hour to add the noodles so they don’t overcook. Being a traditional dump soup, all cans go in at the same time, saving you time and prep.